BACKGROUND: Aegis Gardens is a senior’s community that focuses on Chinese culture. This community, situated in the Seattle area, is designed to be warm and inviting with thoughtfully designed architecture and interiors that are based on feng-shui. The facility provides 24-hour care provided by a professional Chinese and English-speaking staff. There are over 2.5million Canadians of Chinese descent and an equal number living in the US – this facility is much in demand as it provides a unique cultural environment for senior citizens to interact and socialize with others from the same cultural background. 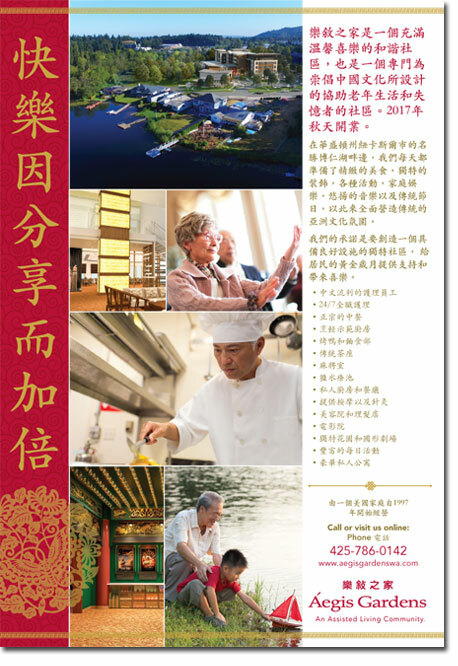 OUR WORK: Both the Vancouver and Toronto multicultural marketing teams contributed to execute a Chinese language print and digital campaign. For print, we provided media recommendations, demographic targeting, graphics, and reporting. On the digital side, we executed a WeChat campaign on the Chinese language mobile app. Our multicultural digital marketing team provided copy recommendation, graphics, translation, and WeChat coding for this campaign.